I got in touch with this heat inside of me. A feeling of anger and needing space to be. A feeling of a deep breath coming out of me. A dragon roar! A couple of months ago I started to contemplate this concept of the dragon energy inside of me. Strong, hot, power to protect me, power to make things happen in the world. I wanted to paint a dragon, but I didn’t know how. 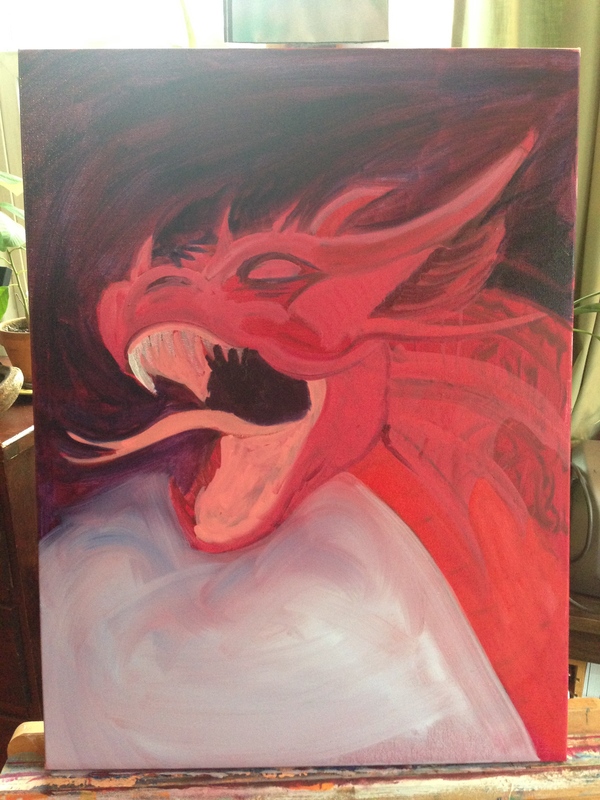 I started to sketch and eventually outlined this dragon painting. It has been a journey of self discovery. I am still learning what it means, what that heat at the base of my spine and through my arms is telling me. Each layer of paint that went on the canvas, each time I took it off the wall and added a little more detail made me feel more connected to my own power. What does power feel like in your body? For me it is red and solid and burning. Telling me what I need and giving me the strength to keep going against adversity. The roar can be silent inside my head giving force to my commitment, supporting me when I get shaky as I step into a new challenge or negotiate what it is that I want. On some level, I had thought that power was dangerous and hard to wield, but the dragon is alert, smart and specific. It knows exactly what it is going for with it’s roar and it’s fire and it’s sharp teeth. It isn’t done yet. Well, maybe the painting is, but the process of discovery is still unfolding.